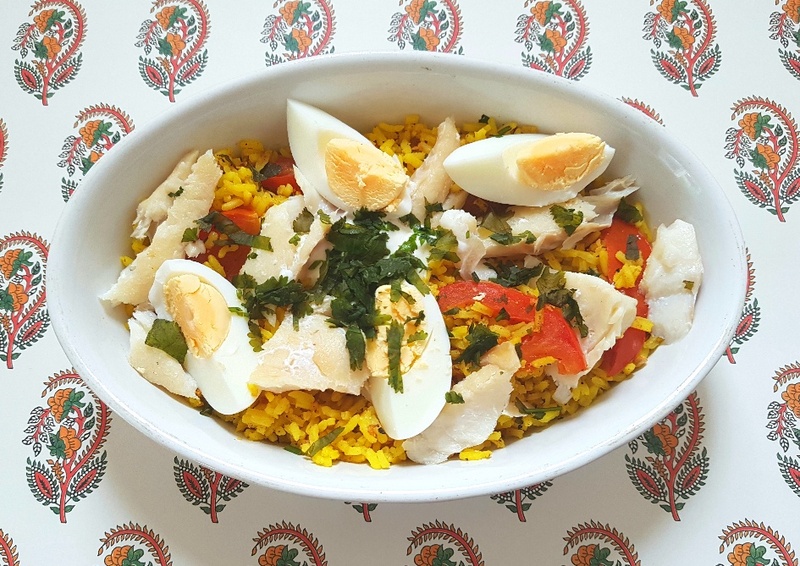 Kedgeree is a breakfast dish which originates from India and consists mainly of rice, smoked haddock and hard-boiled eggs which are infused with curry spices. It might sound like an odd choice to have for breakfast because, let’s be honest, not many of us would reach for rice and smoked haddock first thing in the morning, but trust me when I say that this is well worth making at least once, my friends! Although I made this kedgeree for a very late brunch one weekend it’s substantial enough to make for dinner one evening, should you be so inclined. Also, even though smoked haddock is the type of fish which is traditionally used in kedgeree, you could replace it with tuna or even salmon (smoked or unsmoked), should you prefer. If you want to save time you could cook the eggs the day before and use microwaveable ready-cooked rice pouches. Kedgeree might not be a conventional breakfast you’d think of reaching for first thing in the morning, but it’s a very tasty one. Its beauty lies in its tender yellow grains of turmeric-infused long grain rice, its generous chunks of tender flaked smoked haddock and quartered, hard-boiled creamy eggs, all of which is encased in the fresh flavours of minced ginger and traditional curry spices. It’s an unexpected, but firm breakfast favourite of mine now! In a bowl, mix the chopped coriander leaves into the natural yoghurt and leave to one side. Put the eggs in a saucepan of boiling water and boil the eggs for around 8 minutes. Drain the eggs and top the saucepan up with cold water. Once the eggs are cool enough to handle peel them, cut the eggs into quarters and leave to one side. Cook the haddock in a frying pan under water until firm. Leave to cool and then cut into chunks. Boil the rice with the turmeric until the rice is tender and then drain. Melt the coconut oil in a frying pan and once it’s melted add the minced ginger, curry powder and sliced tomatoes. Fry until the tomatoes are soft. Add the rice and haddock to the pan and heat through. Add the chilli (if using) and then add the quartered eggs. Serve with dollops of the coriander-infused natural yoghurt.